Confession time: I didn’t know if I really wanted World of Final Fantasy when it was announced. While the idea of a cute Final Fantasy aimed at a younger and broader audience sounded interesting, it didn’t appeal to me much as a fan of the main Final Fantasy games. But World of Final Fantasy's trailers and character announcements thankfully kept my curiosity, because it ended up being my favourite game from 2016 and one of the best JRPGs I’ve played in a long time. With cute and charming characters old and new, and a surprisingly complex monster-hunting system incorporating all the memorable Final Fantasy creatures fans know and love, World of Final Fantasy is a must-play for JRPG and Final Fantasy fans looking for a fun and more traditional Final Fantasy adventure. What sets World of Final Fantasy apart from most Final Fantasy games is that it includes new characters alongside characters from other Final Fantasy games, all in the intriguing world of Grymoire. This mysterious world is full of species called Lilikins, which are ‘chibi’ humans, and monsters called Mirages. The charming twin protagonists Reynn and Lann are Jiants from another place called Nine Wood Hills that find themselves given access to Grymoire by a woman called Enna Kros after awakening with amnesia. She provides them with assistance in the form of two pixie mirages, the adorable Tama and the hilariously dry Serafie, makes them aware of their power to wield mirages and sets them on a journey through Grymoire to capture them to get back their lost memories. Grymoire features some of my favourite characters from older Final Fantasy games, including Tidus and Yuna from Final Fantasy X, Vivi from Final Fantasy IX and more, along with characters from Final Fantasy games I haven’t played that I was meeting for the first time. There are plenty of great moments with characters I love that often had me wearing a stupid grin on my face throughout my playthrough and despite featuring so many different characters, each character fit well into the 50 hour adventure and seeing them all talk to each other was really amusing as a fan of the series. In spite of the nostalgic cast of old characters, the characters I ended up loving most were Lann, Reynn, Tama and Serafie, the fun new cast full of purpose and banter, with the four pretty much being my new favourite comedy group. I really appreciated Reynn and Lann’s constant brother and sister bickering, Tama’s oddly endearing incorrect use of articles and Serafie’s flat line of enthusiasm for everything, all complemented by fantastic voice acting. They manage to fit in with the old characters perfectly and every new character encounter was enriched by the fun new crew, making the story an enjoyable ride with well-timed emotional twists along the way. 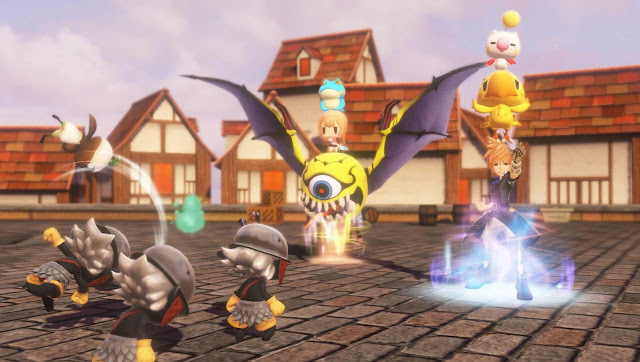 World of Final Fantasy features more than enough Mirages for Reynn and Lann to collect and also more iconic Final Fantasy monsters than I expected before playing. There are Behemoths, Floating Eyes and Flans; a good majority of the monsters I remember grinding and fighting in main Final Fantasy games. Rather than throwing these monsters beside Reynn and Lann after imprisming them, you get to stack them on top of each other to combine stats and create a really funny-looking stack that can pack a punch in battle. The stacking and mirage systems are a great new way to create a party to battle with and the skill trees to upgrade or transfigure (evolve) these mirages into bigger ones gave the right amount of complexity to upgrading characters. 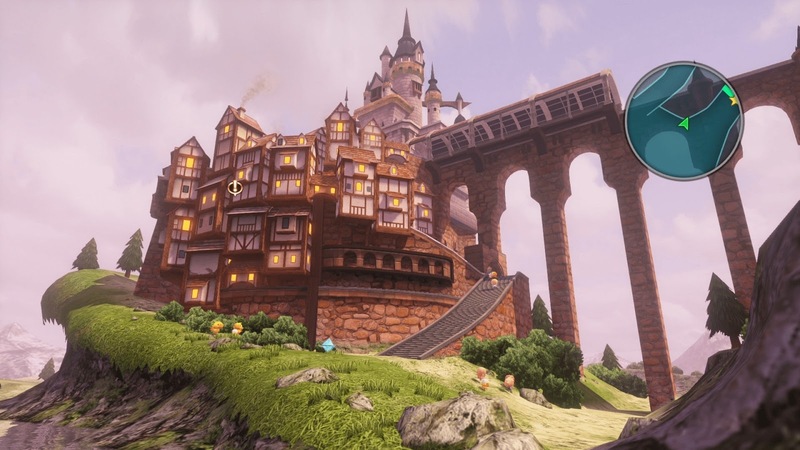 Mirages are also useful outside of battle as they can fly Lann and Reynn over ledges or push down big boulders or even be ridden on, finally giving me the chance to ride a Behemoth! 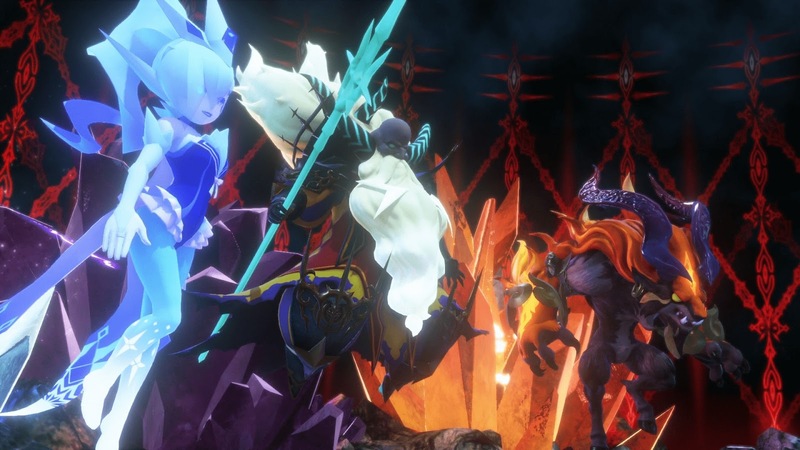 For a series that doesn't usually involve monster hunting, the system fit in seamlessly with the familiar with other battle elements and I appreciated the potential for variety in my party. Speaking of battles, World of Final Fantasy features the familiar Active Time Battle system, revamped with shortcuts incorporated to make switching between each mirage's and character's abilities very easy. World of Final Fantasy is nice of enough to include various modes for the system, including Wait, Semi-Active and Active modes, with Active mode keeping things extremely fast paced and wait mode being closer to the Final Fantasy X system, which I felt most comfortable with. Even though I stuck with how I usually play JRPGs, I really appreciated having the option to change between these if I wanted a challenge and I’m sure it will help every kind of Final Fantasy player find something they’re comfortable with. The battle system doesn't stray far from what fans would expect from a Final Fantasy game, but the addition of character medals incorporating old characters and Mega Mirages (summon abilities) later in the story were some fun additions to an already solid system. Topping off the battles and roster of characters is a Colosseum full of extra battles, hours of extra quests before and after the ending, and plenty of mirages to collect to for those like myself who want to continue playing after the credits roll. There’s a gorgeous soundtrack and all the NPCs are voiced, making the quality of World of Final Fantasy feel high. Especially on Vita, World of Final Fantasy feels like a massive JRPG for the system and I had a lot of fun playing it on the go, especially with the story split into chapters. However, if you have the choice between the PS4 or PS Vita version, I would recommend choosing the PS4 one. I played the PS Vita one in full and had a great time and thought it looked gorgeous on my Vita, but some minor issues I had were noticeable load times, especially when trying to switch out Mirages using the Prism Case. Plus since I use a 4GB memory card and my copy was digital, the file was a squeeze and I couldn’t download any of the update files because my memory card was completely full after downloading the World of Final Fantasy file and my day one DLC. I played the PS4 demo and the difference in graphics and load times fixed pretty much all of my problems with World of Final Fantasy. In saying that, I’m such a supporter of putting big games on the Vita and probably wouldn't have been able to play World of Final Fantasy as quickly as I did if I could only play at home, so it's still an incredibly high quality Vita game for those who also prefer playing on Vita. World of Final Fantasy is the most surprising and satisfying JRPG I played in 2016, both as a monster collecting game and as a Final Fantasy game. 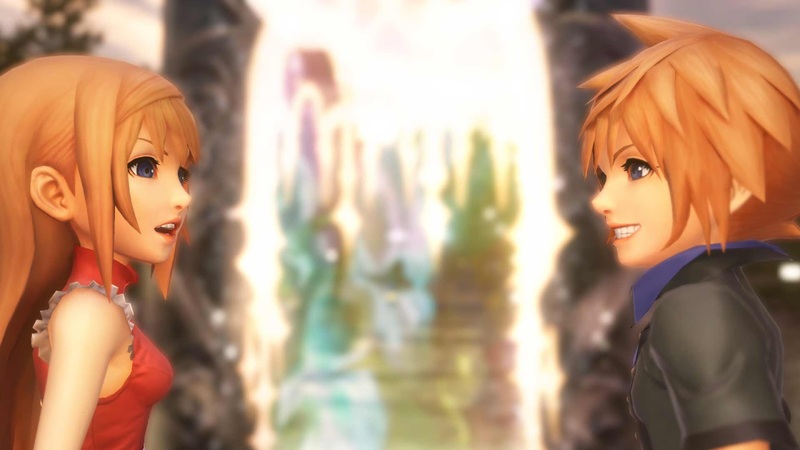 Reynn and Lann are my favourite Final Fantasy protagonists of recent times and with so many mirages to collect, characters to meet and things to do in the world of Grymoire, World of Final Fantasy has left me with all the marks of one of my favourite JRPGs: it made me laugh and cry in a way only my absolute favourite games have and I want to max out all of my mirages and stay in the fascinating world of Grymoire just a little longer. 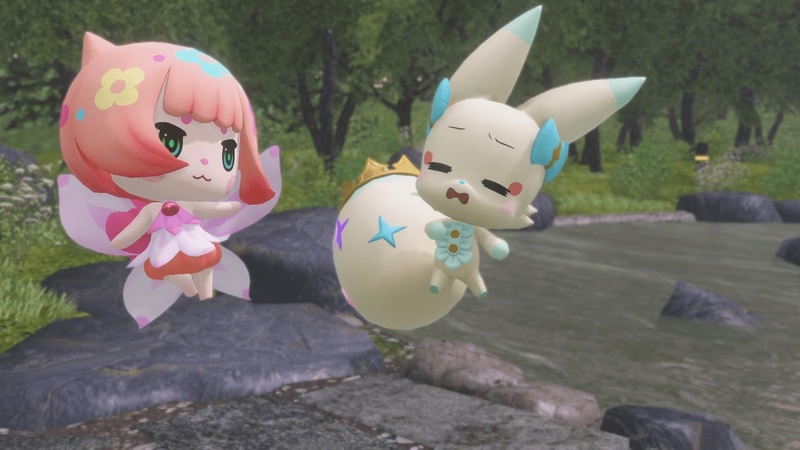 If you’re a JRPG or Final Fantasy fan, I highly recommend World of Final Fantasy’s great new twist on monster collecting, emotional story and fun gameplay for a fantastic JRPG experience. I feel like I took a long time to get this review up because I was enjoying World of Final Fantasy so much that I enjoyed taking my time to catch mirages, do quests and really enjoy the story. One of the best Final Fantasy's in the last few years and I really hope Square Enix makes this a series of its own. Sequel please! You can pick up World of Final Fantasy for PS4 and PS Vita (and a cool limited edition World of Final Fantasy PS Vita) at Play-Asia.com! What did you think of World of Final Fantasy? What's your favourite of the recent Final Fantasy games? 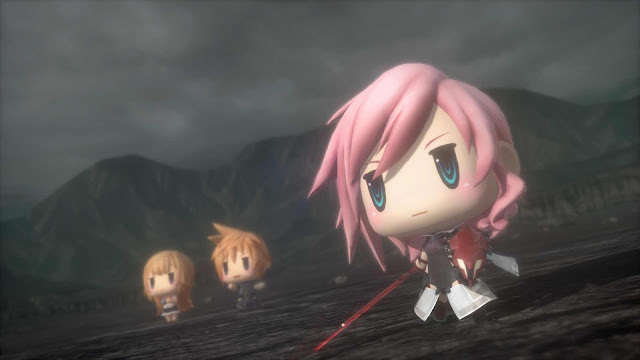 Picture note: I got most of the photos for this review from the official World of Final Fantasy website and they are most likely from the PS4 version of the game. I also really adored this game and did not think it would be even 1/0th as good as it turned out to be. I really hope they make a sequel in a year or two, and release it also on Vita. I am not sure how well it sold on Vita let alone PS4, but I bought it for Vita day one, and would it's sequel. Well I am not surprised it does not appear on any top sellers list, it was always going to appeal to a niche market. The fact it also got no real promotion on the PSN store especially the Vita version did it no favours at all. What surprised me most was even after the game got excellent reviews from most the major websites (IGN, Game Informer ) etc, they still di'nt promote it. True, they definitely focused their promo on FFXV. I understand they wanted XV to do well, but WoFF was a great game that deserved to sell well too.